Let me preface this new feature at Cheese Magnet by pointing out once again (as I did in my Nazi Flying Saucers post) that while I’m absolutely obsessed with this sort of thing, I wouldn’t necessarily call myself a believer. However, that doesn’t mean I’m here to ridicule the subject matter or that I reject the possibility of Bigfoot (or whatever) outright, either. I just dig the monsters and the aliens. I’m not going to try to give in-depth reports on these beasties — this series is more about spotlighting some of my favorites. 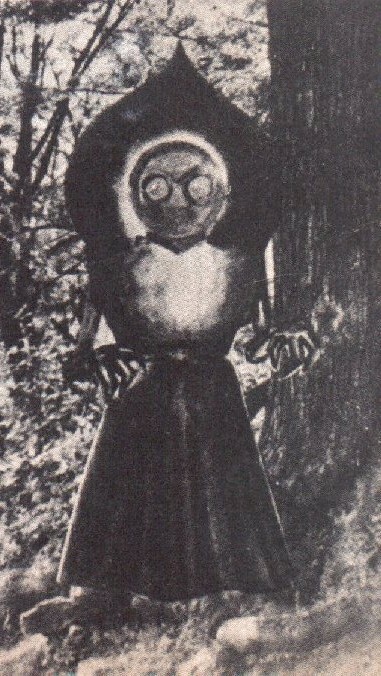 So, all that said — our first Crypto-Creature of the Week is The Flatwoods Monster. This mysterious being falls more into the category of UFOlogy than Cryptozoology, but if it’s got the word “monster” in its name then I figure it’s fair game. 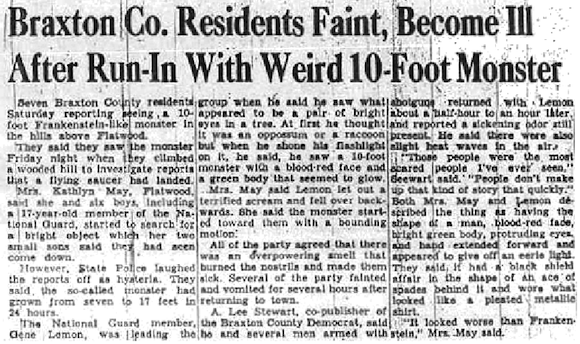 In September 1952 in Flatwoods, West Virginia, three kids saw a UFO apparently land in the woods. The kids and four other people went to investigate, stumbling upon a ball of fire and a stinky mist that made them sick (the stinky mist could easily be attributed to some of my relatives back in WV). One of the investigators then noticed what appeared to be a pair of eyes peering at them from amidst the trees, and training his flashlight in that direction, revealed a 10-foot-tall creature with a glowing red face, clawed hands, and sporting a pleated skirt. The monster shrieked and flew towards them before zipping off towards the ball of fire. Eventually, reports of other encounters with the creature surfaced, as well. “Experts” have attempted to explain the sighting by claiming that the witnesses mistakenly identified a barn owl, but I must admit, this sort of thing has long been a pet peeve of mine and smacks of an elitist mentality — obviously the backwoods rubes just saw an owl and the moonshine did the rest, hmf hmf, let’s get back to our arugula-glazed tofu pups. I know a lot of people who live in West Virginia and Kentucky, and they all know an owl when they see it (even when they’re drunk off their asses). That doesn’t mean they might not be startled by one but they’d sure as hell figure out what it was as it was flying away. Same goes for the African natives that are obviously misidentifying hippos when they think they’ve seen Mokele-mbembe, the living dinosaur — uh, those guys see hippos every friggin’ day of the week. I’m not insisting that the residents of Flatwoods saw an alien or a monster, or that those African natives are seeing a dinosaur — my point is merely that it’s like saying a guy who works in an office every day is clearly misidentifying his stapler. Let’s give the locals the benefit of the doubt, at least a little bit. While I definitely like this particular monster a lot, I do wish it had gone on more of a rampage or at least tipped over a pickup truck or something. Still, pretty spooky stuff when you’re out in the middle of nowhere. 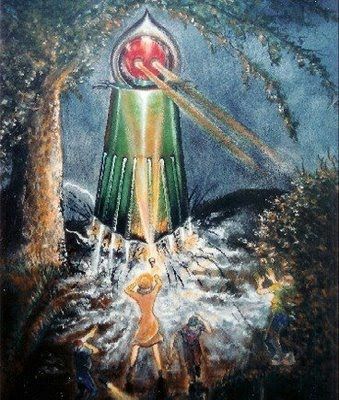 Nowadays, you can buy toys and model kits of the Flatwoods Monster, as well as t-shirts and fancy art prints, and there’s plenty of info on the case to be found online if you feel inclined to investigate further. Meanwhile, I leave you with this video of UFOlogist Stanton Friedman discussing the case.